We will be keeping this updated throughout the year so please keep checking this page. We will be posting next weeks learning on here, as well as photos and links to online resources. Please feel free to contribute to the Reception's Homepage by contacting us at the bottom of this page. Phonics is simply the sound of which a letter or letters make. At Holy Family School we use a phonics scheme called 'Read Write Inc' that teaches the children how to read, write and spell. It is recommended that you attend these sessions to ensure that you know how to pronounce these 'pure' sounds and to enhance your child's learning at home, for example when reading we sound out the letters (using our phonics) and blend them together to read the word e.g. m-u-m blended together is mum. 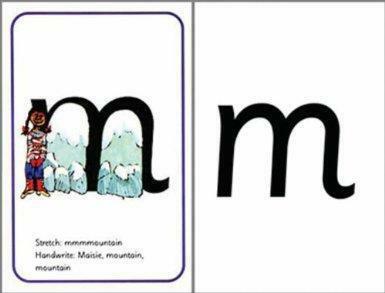 We also teach them to hand write with a specific phrase for each sound that we will teach on Friday's to aid letter formation at home (for example the letter 'm' we teach as 'down Maisie, mountain, mountain' as a visual aid to help them to form the letter correctly). If you have any activities that you currently do at home to support phonics, or any other area of learning, then please share it with us by contacting the Reception Team at the bottom of this page. This video shows you how to pronounce sounds in a 'pure way', it compliments our Friday Phonics Session by teaching you how to make 'pure' sounds. Phonics Blending Explained - how to teach blending to children. How to teach blending and a teacher demonstrates. Phonics Blending Explained - how and why we teach it (the teacher demonstrates how 'Fred Talk' is used). We are aware that many children in school have access to an iPad or similar devices that support 'apps' at home, therefore we would like to recommend some great educational apps to download. Please note: these suggested apps are free! You may wish to download further content in the app which might come at a cost. Do contact us with any that you recommend. App - Bee-Bot Complements the children's use of using the real Bee-Bot in school. Practise on this helps the children to be able to make toys work by pressing parts to achieve effects such as sound and movements. App - Maths Counting Board Teach your children to count from 1 to 100 by tapping the numbers one by one and reading it loudly, learn to add (5+2=7.... first tap 5 then tap the next two blocks and the answer will be 7), similar method for subtraction for when they reach that stage in their learning. App - Puppet Pals Children can create their own simple animation story by using the different character puppets and settings, and even record their own voice. There is a similar app created by the owners of this app that is a Biblical version (to help Bible stories come to life), but you have to pay for it. With many children also having internet access on a computer or laptops at home and in local libraries, here are a few links to websites that we often use in class. The children should be familiar with these sites as we use them during CIL on the school laptops or interactive white board. Children are often exposed to tablets which don't have any peripherals (such as a mouse and keyboard) therefore when using these sites at home your child may require some support using the mouse (dragging and clicking) or using the laptop touch pad (dragging and clicking on a laptop) or finding the letters on the keyboard (as all letters are presented as capitals yet type as lowercase). Practise on a computer will aid your child to master the use of a mouse and a keyboard as we look forward to using the ICT Suite in the coming term. Link - Website & Tablet Friendly - 250 FREE eBooks You'll have to register (for free) and login, but well worth a visit! Link - BBC Nursery Rhymes We use these songs and videos in class regularly.